Myogi Shrine (妙義神社) is one of the oldest shrines in Japan. It is located at the Mt. Myogi, Gunma Prefecture. It was established in 537. There are many the national important cultural assets. It's been highly respected as the god of business and prosperity since old time until today. During Edo period, Many Shogun and other powerful Daimyo all over Japan, worshiped here and donated many buildings. From the top of the main shrine, it has a beautiful view of all Kanto region. It has a beautiful sweeping Sakura that bloom in April. Drive route 18 west and change to 51 to 213. 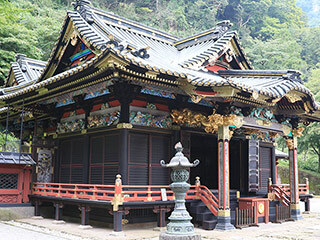 Myogi Shrine is one of the three major shrines of Gunma Prefecture. It was established in 537 under Mt. Hakuun, the top mountain of Mt. Myogi. It's been highly respected as the god of business, protect fire, education and farming. There are many buildings that were constructed in the beginning of the Edo Period. Constructed in 1773. Unlike other shrines, this gate still has Nio Statues. It is registered as the national important caltural asset. Constructed in 1756. This hall has beautiful carving arts with rich colors.